What’s the Obsession with Large Portions? And what is the cost to our bodies and to society? In the last twenty years obesity rates have doubled. Thirty-eight percent of US adults are obese along with 17 percent of teenagers. 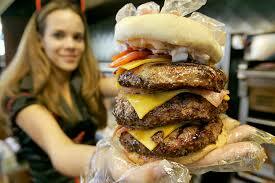 Three quarters of all Americans are expected to be obese by the year 2020. Obesity is caused by an energy imbalance over a long period of time, where more calories are consumed than used. Obesity is defined by your Body Mass Index (BMI). BMI is a numerical equation measuring your height along with your current weight. Having a BMI rating of 25 will indicate that you are overweight, but a BMI rating of 30 defines obesity. There is an obsession with large portions. There is a decreased amount of down time that leads to an increased consumption of sweets and processed food with saturated fats. There is a decrease in physical exercise. While some may think it’s just easier and acceptable to eat large portions of food with little or no nutrients, the damage to your body over time proves this to be a false belief. After years of continuous weight gain, you invite type 2 diabetes, heart disease, or stroke into your life along with the serious effects of these preventable illnesses such as hospitalization, amputation, or dialysis. But there are earlier warning signs before these devastating conditions appear that should be recognized. You may feel depressed and isolate yourself. You’ll tire easily, lose your breath quickly, or become sedentary. You start to live with chronic pain in your joints and back. In time your professional and personal goals become forgotten. Obesity increases compression at our weight bearing joints (ankle, knee, hip, spine) causing increased breakdown leading to arthritis. The consequences of weight gain are visible early on and excess weight will begin to affect your life and health immediately. The cost of living in denial is too high. When you understand the true cost of obesity to your life, and can take responsibility for your own actions, you have the power to stop this trend. Understanding the cost to your life and health each time you overeat. Be aware of food portions. Eat what you like; just learn how to eat it healthfully. Get and stay active both mentally and physically. If you think you don’t have the time to care for yourself, you will have to find the time to be ill. Be proactive with your health-the payoff is your good-life!